I used the fabulous sketch of Heather, which she did for the Whiff of Joy Challenge blog. The theme at Cute Card Thursday is to use something you got or bought for yourself for christmas. I got the halfpearls and the heart shape from a friend for christmas. 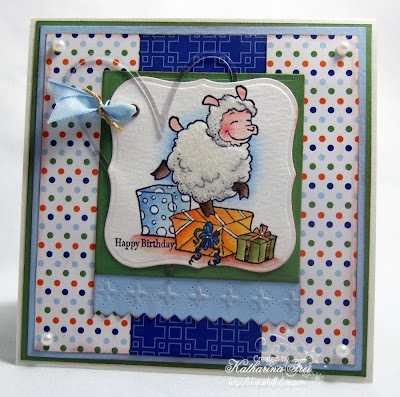 I used my Spellbinders Piercabilities for the border below the image (Molly Celebrating Sheep from the new Whiff of Joy Party Animals release designed by Alison Acton). I used white fun flock for her body and cut her out with Spellbinders Labels 1. Ich habe den tollen Sketch von Heather verwendet, den sie für den Whiff of Joy Challenge blog entworfen hat. Das Thema bei Cute Card Thursday ist ein Geschenk zu verwenden, dass man zu Weihnachten bekommen hat oder sich selbst gekauft hat. Ich habe die Halbperlen und die Herzform von einer Freundin bekommen. Die Borte unter dem Stempelmotiv (Molly Partyschaf von der neuen Whiff of Joy Party Tiere Kollektion designed von Alison Acton) ist von Spellbinders (Piercabilities). Ich habe weissen Fun flock auf dem Fell von Molly verwendet und sie mit den Spellbinders Labels 1 ausgestanzt. Dawn and Jaqueline had some fantastic publications in a magazine using the Whiff of Joy Stamps! Wow Ladies, congratulations!! Dawn und Jaqueline wurden mit ihren Whiff of Joy Karten in Magazinen veröffentlicht. Wow Ladies, herzlichen Glückwunsch!! Oh this is lovely your colouring is beautiful. beautiful card, very sweet image and gorgeous papers, the piercing looks fabulous! OMG what a cute card!!! gorgeous, that sheep looks so touchy feely, i mean it looks soft!! Aren't the new WOJ images so fun!!! Katharina what a darling card!! Oh,dass ist ja auch eine ganz tolle Karte! Die Gestalltung und Farben gefallen mir sehr gut! I like sheep, this is so cute. Gorgeous card, I love the vibrant colours and the fun flock effect! Ps: My stamps have arrived, thank you! Now I really have to buy myself some EZ! LOL. Fab card! Love the flocking on the sheep!